I have not lost my memory or gone mad. I am aware that Cameroon did not qualify for the African Cup of Nations that kicks-off this Saturday in Equatorial Guinea and Gabon. However, there are a handful of players originally from Cameroon who are representing other nations at this tournament. 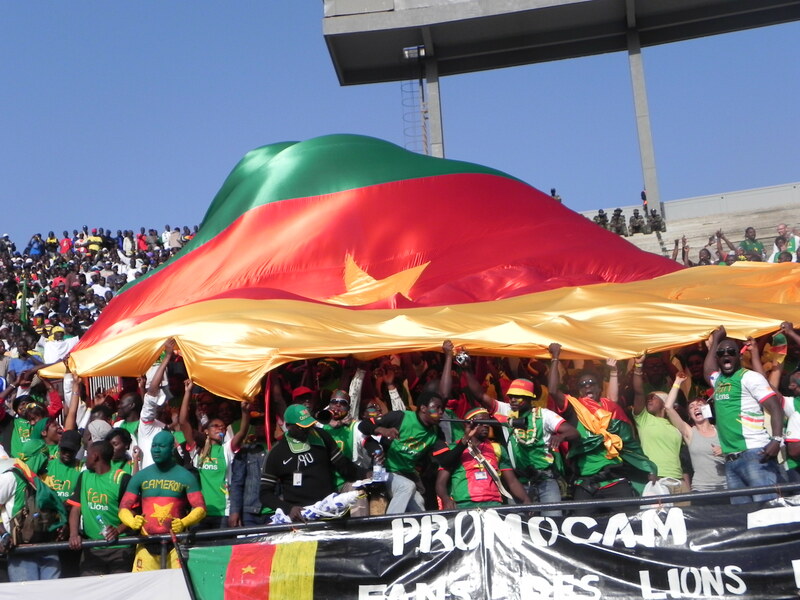 The bulk of the ex-Cameroonian contingent will be defending the colours of co-hosts Equatorial Guinea. Five members of their 23-man squad — Narcisse Ekanga (midfield), Thierry Fidjeu (forward), Douwala Ellong (forward), Raul Juan Maximo Eyama (midfield) and Achille Pensy (goalkeeper) — hail from Cameroon. Ekanga, who plays his club football for TP Mazembe in the Democratic Republic of Congo, had played for Cameroon at U-17 and U-20 levels but with so many central midfielders ahead of him in the pecking order, it is no surprise that he was willing to switch nationalities. The young goalkeeper Pensy also featured for the U-17 Lions at some point in his young career while Thierry Fidjeu waited in vain for a call to bolster the Indomitable Lions attack before settling for the Nzalang. There’ll certainly be families jubilating in Douala, Bafoussam and Yaounde should the Nzalang Nacional score a victory over the Knights of the Mediterranean (formerly known as ‘Greens’) of Libya in the tournament’s opening game. Nzalang Nacional fans would surely be hoping that these Equato-Cameroonians would be as successful for their team as Lauren Etame Mayer, born in Cameroon to Equato-Guinean parents. He played for the Indomitable Lions between 1998 and 2002 and won two African Cup of Nations and an Olympic Gold Medal. It should be noted, however, that the Equatorial Guinea team also features players originally from Liberia, Ivory Coast and Nigeria. There are also a few ex-Brazilians, as well. All are naturalised and should bag home the $1 million promised by the son of the country’s President, if they can win that opening game! William Tondji Ngounou will be representing Niger. He is a striker who plays professional football in Sweden. He was born in Cameroon but left the country at the age of 10 to live in Niger with his Cameroonian parents. He has since opted to play for the Mena du Niger. His national team mates include goalkeeper Dauada Kassaly and midfielders Abdoul-Karim Lancina and Idrissa Saidou who play their club football in Cameroon at Cotonsport Garoua. 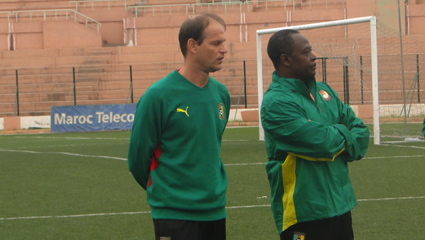 Niger held their pre-tourney training camp in Cameroon. They played a host of friendly games with local clubs and Cameroon’s national selection team of players based at home (or those who have yet to cross the border to play for Equatorial Guinea!). Two other countries camped in Cameroon before the competition — Botswana and Burkina Faso (Their stay at the Kadji Sports Academy makes them a little Cameroonian, no?). Burkina Faso could even have fielded another ex-Cameroonian in Herve Zengue who was surprisingly left out of the Stallions squad. Zengue, who is married to a Burkinabe citizen, played for the Stallions in two qualifying matches against Namibia. But the southern African nation claimed was not eligible to represent Burkina Faso and asked for the West Africans to be disqualified. The matter was only recently decided against Namibia by the Court of Arbitration for Sport (CAS). Sadly, by that time, coach Paulo Duarte had decided not to pick Zengue for the tournament. Gef’s Football Club will provide tactical previews and analysis of some of the games at this tournament. British TV pundits praised Benoit Assou-Ekotto for his consistency at Tottenham Hotspur after the Cameroonian contributed to his club’s 2-0 defeat of Aston Villa on Monday. Assou-Ekotto (with a new hairdo) didn’t look perturbed by news that the Cameroon Football Federation (Fecafoot) had summoned him to appear at a disciplinary hearing this week, for failing to join Cameroon’s national team at a camp in Morocco. 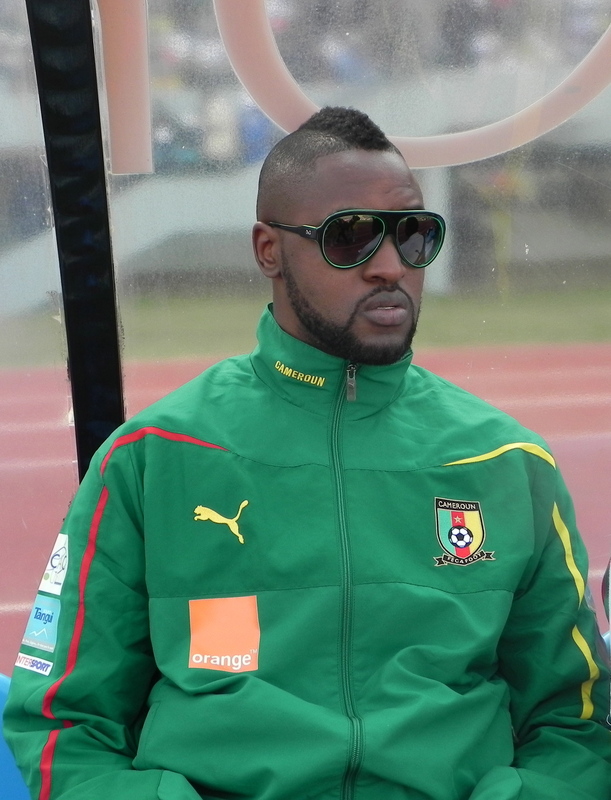 Has he ditched playing for Cameroon since February as a Douala-based TV station, Equinoxe TV, said on Monday? That story seems to be making the rounds in the media. But the facts of the story don’t match reality. If Assou-Ekotto ditched the Indomitable Lions since February (!!? ), was it his clone that I saw playing at leftback against Senegal on 26 March 2011? 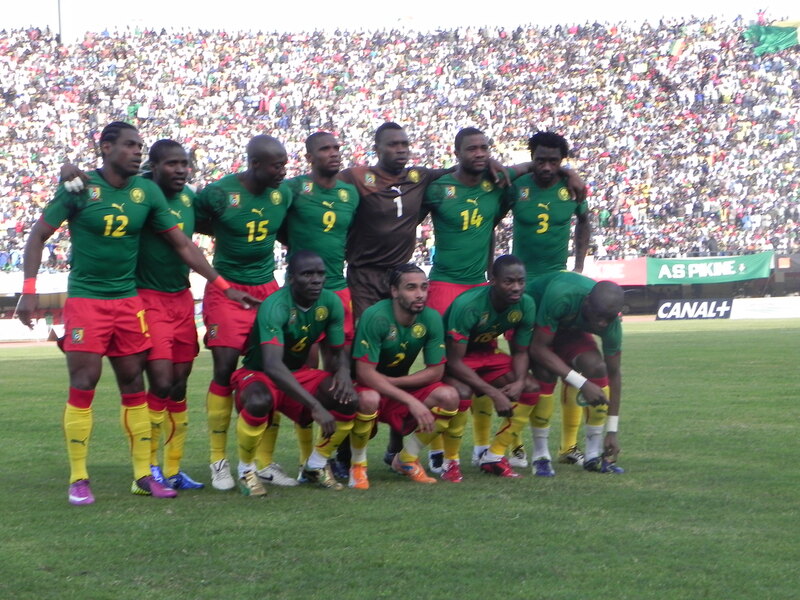 Assou-Ekotto is second from left among players crouching as Cameroon players pose before playing Senegal in Dakar on 26 March 2011. Or was it his clone? 1. In February, Javier Clemente (then Cameroon head coach) does not pick Assou-Ekotto for a friendly against Macedonia. After some players fail to turn-up, the Spaniard hastily recalls the leftback. Assou-Ekotto does not respond to the call. 2. In March, Clemente does not select the leftback for the crucial Africa Cup of Nations qualifier against Senegal in Dakar.There is criticism from the media, the fans, Fecafoot and Ministry of Sports officials. Reports say the coach feels undermined by the player’s refusal to come as a back-up in February. When it appears that Clemente’s preferred leftback Gaetan Bong is injured, the coach is seemingly pressured to recall Assou-Ekotto. 3. The player joins the Lions’ camp in Portugal and eventually plays against Senegal. The media in Senegal describe him as Ca meroon’s man of the match alongside midfielders Landry N’Geumo and Enoh Eyong. 4. In May Assou-Ekotto is picked by the national team trainer for the return-leg game against Senegal but he does not travel to Yaounde. N.B: The player was recovering from an injury sustained days before the game. 5. After the 0-0 draw that basically knocked Cameroon out of the race to qualify for the Africa Cup in 2012, Fecafoot summons Assou-Ekotto to a disciplinary hearing for not appearing for that game. The player does not physically appear for the hearing but reportedly forwards documents explaining he was injured. The committee issues a warning. The rule book says injured players must have their injuries confirmed/examined by the national team doctor. 6. In August, ahead of a supposed friendly against Salvador, Clemente does not name Assou-Ekotto in his squad. The match fails to hold, though. 7. In September, Clemente names the squad for the qualifier against Mauritius in Yaounde and a friendly (that did not hold) against Mexico in Paris but Assou-Ekotto is not selected. When pressed on local TV, Francois Omam-Biyick the then deputy head coach says Clemente is still angry about Assou-Ekotto’s failure to appear for the game against Senegal in June. Omam says, the head coach views such behaviour as indiscipline. 8. In October, Clemente selects the squad for the final Africa Cup qualifier against the Democratic Republic of Congo and a friendly against Equatorial Guinea but does not pick Assou-Ekotto. 9. With Clemente and his whole backroom staff sacked after the game against Equatorial Guinea, his successor Denis Lavagne names Assou-Ekotto in a team of 28 players for a series of friendlies in North Africa (versus Sudan, Morocco and Algeria). 10. 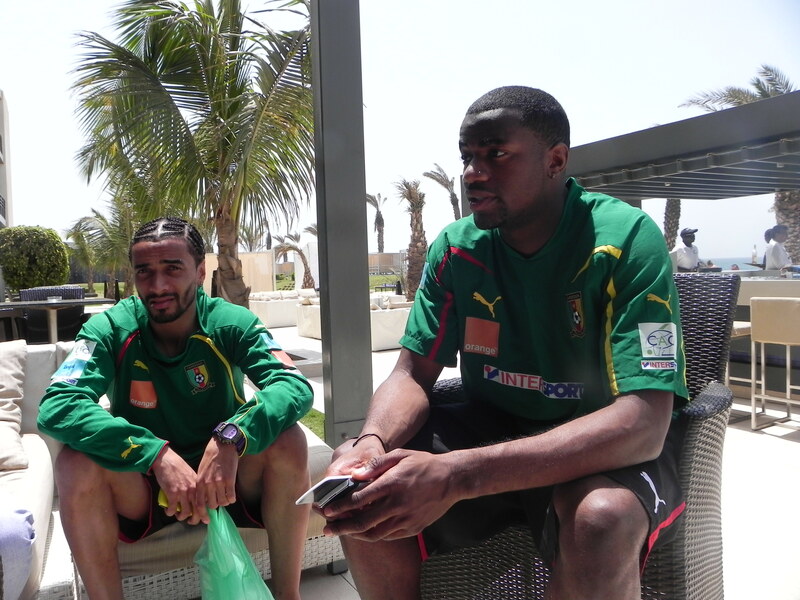 Assou-Ekotto and several other players fail to make it to the camp in Marrakech in early November. The head coach Lavagne says Assou-Ekotto was injured. Why then is Assou-Ekotto being dragged to the disciplinary council? Did the coach lie to the journalists? Is Assou-Ekotto charged for not showing up to have the team doctor to confirm his injury as Aurelien Chedjou and Nicolas Nkoulou did? Why have Fecafoot not summoned Somen Tchoyi and Benjamin Moukandjo who were also reportedly injured but did not travel to Marrakesh? Javier Clemente: Was this his last game in-charge of Cameroon? Cameroon and Equatorial Guinea played a 1-1 draw in an international friendly on Tuesday in Malabo. 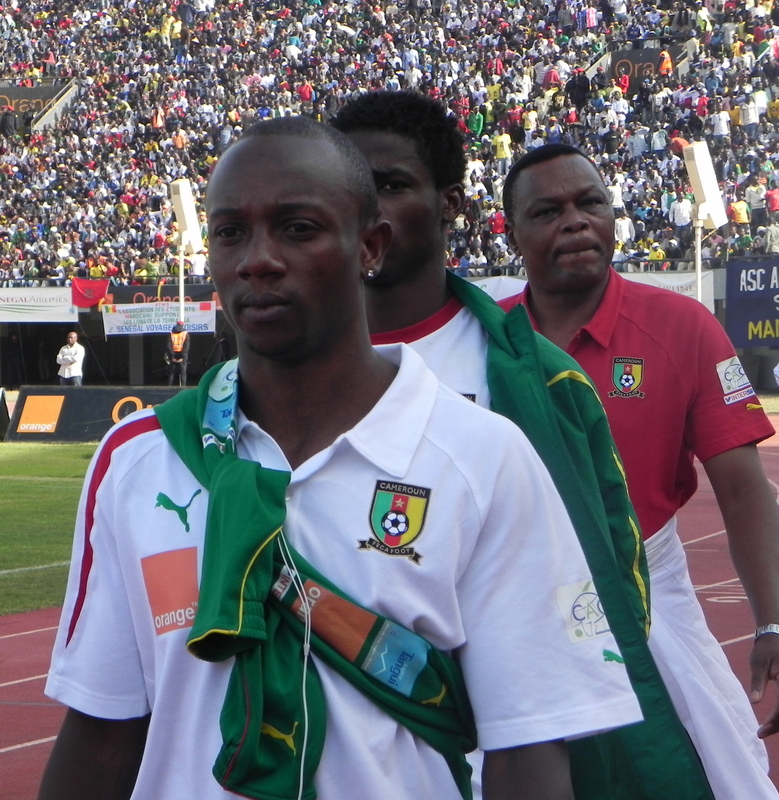 The Lions scored the curtain raiser through striker Leonard (Leonie) Kweuke before their hosts equalised. .
Cameroon coach Javier Clemente fielded a second-string team for this encounter apart from Alexandre Song who was duly withdrawn by the second-half to prevent him picking-up an injury. Cameroon’s passing, especially in that second-half, was really woeful. Eric Djemba Djemba showed again that he doesn’t deserve to be recalled to the team, often losing possession as was the case against Mauritius and Congo (Kinshasa). Abouna Ndzana, the young Astres Douala full-back who deputised at right-back, showed enthusiasm surging forward, but he was often caught out of position. His short-passing was unimpressive and he kept kicking the ball long to the forwards who were not the tallest in the world once Kweuke had been substituted. The players generally looked tired and sluggish. This was not helped by the rugged play by the hosts whose tackles that gave a stop-start tempo to the game. It was unpleasing to watch. A [particularly bad challenge against Kweuke forced the Cameroon coaches to replace him with Benjamin Moukandjo Bille just before half-time. His teammates got enraged when the referee didn’t whistle for a foul or warn the Equato-Guinean player. The 2012 Africa Cup of Nations co-host showed determination and power which led to their equaliser. 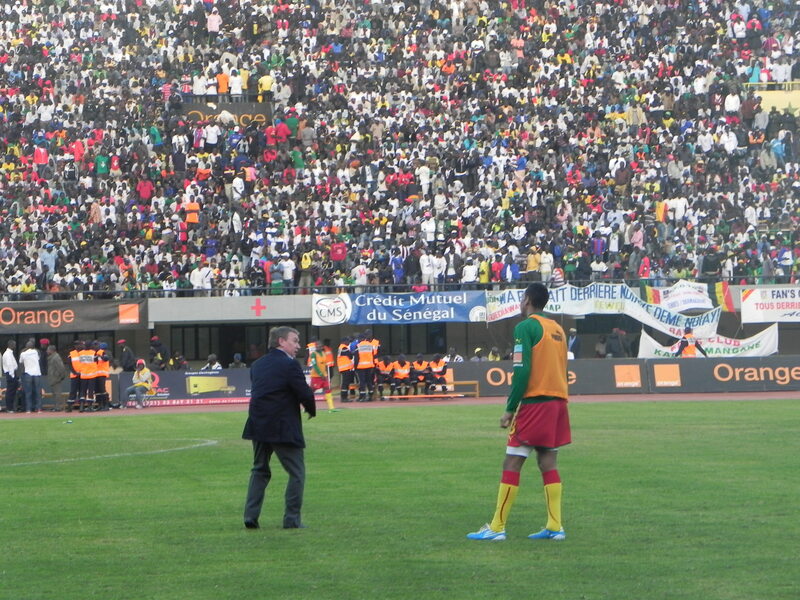 But they hardly ever got near to Jules Goda’s goal area on his 1st start for Cameroon. Edgar Sali, who only five months ago was still playing for the U-20s, gave a good account of himself. However, his set-pieces were poorly taken whereas that is one of his strengths. Will this be Clemente’s last game as head coach of the Indomitable Lions? The rumour mill has been grinding since Cameroon failed to beat Senegal in June. The Spaniard however says he is there to re-build the squad and is in for the long-term with Cameroon regardless of the team’s failure to qualify for next year’s AfCon tournament. The re-building process continues next month when Cameroon plays two international friendlies against Ivory Coast and Algeria. Will the Spaniard be in-charge then? Samuel Eto’o, Mbuta Adongcho and Leonie Kweuke all scored for Cameroon when they beat Mauritius 5-0 but the most outstanding performer for the Indomitable Lions was Eric-Maxim Choupo-Moting. He scored twice and tormented the opposing defenders for 90 minutes. Choupo-Moting was the bright spot in a tedious first-half in which Cameroon could not break down the very defensive 4-5-1 (practically 4-6-0) formation built by the Mauritius coach. Playing in a 4-2-3-1, as we had predicted, Cameroon were unable to start attacking moves from midfield as both central midfielders had difficulty being creative. Head coach Javier Clemente would surely come under a barrage of criticism for choosing to play Alexandre Song and Eric Djemba at the same time. His choice to go with Henri Bedimo, a defender (left full-back) as part the three players supporting the main striker also backfired as the Montpellier man could not deliver the creativity and penetration required. Bedimo was substituted at half-time and his replacement, Kweuke, scored barely three minutes into the second half. By then, Clemente had moved Samuel Eto’o to the wide left position. The imposing Kweuke played as the sole front-man supported by the technically gifted Choupo-Moting. Eto’o dribbled with ease on the left and after a series of good moves with Choupo, the Anzhi striker made a superb pass for Mbuta Adongcho to score Cameroon’s second. However, the Lions midfield remained cumbersome until Djemba was substituted for Landry N’Geumo who simply turned the game around with his movement, forward passes and energy. It is no surprise that the rest of Cameroon’s goals came after his inclusion. It had taken a while but Clemente finally realised that keeping N’Geumo on the bench was an error. Choupo-Moting gave the crowd moments to cheer with dribbles, twists and turns which left the Mauritius defenders on the floor. He excelled in all forward positions – playing wide but also coming into the centre to make quick one-two passes that created scoring chances for the Lions. We can’t read too much into this performance given that it was against football minnows like Mauritius but the coaches have to tailor the cast around him. Mbuta Adongcho scored some points through his zeal and dynamism. He was willing to take up positions in the 18-yard box that put pressure on the islanders and it is no surprise that he scored twice (one seems to have been cancelled for a handball). But he was caught offside (on the wings!) on several occasions which betrays a certain lack of tactical and positional sense. The Lions would be happy to have broken their barren patch but Cameroon should have scored more goals – given how weak the opponents were. Unfortunately, cohesion was a problem until the second-half. There were four changes from the game against Senegal, including two players who have not been in the squad for over a year. The team was crying out for a friendly or two. It is shame that they can’t get one. They need it as part of the reconstruction effort ahead of the next qualifying campaign. 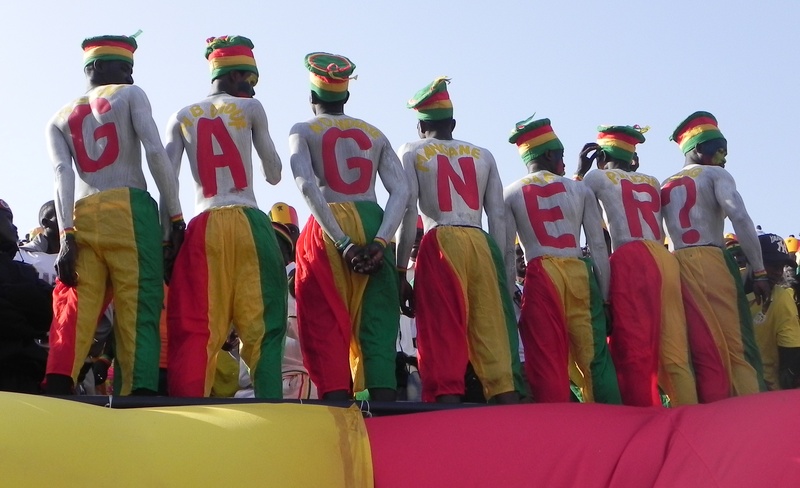 By the way, Senegal have already qualified for the 2012 Africa Cup of Nations as group winners after they beat the Democratic Republic of Congo 2-0 in Dakar. Cameroon’s starting line-up for Saturday afternoon’s game against Mauritius has been released with Javier Clemente giving a first competitive start for the U.S.-based winger Mbuta Adongcho. Idris Carlos Kameni (GK); Benoit Angbwa (RB) – Nicolas Nkoulou (CB)-Aurelien Chedjou (CB) – Gaetan Bong (LB); Eric Djemba Djemba (CM) -Alexandre Song (CM); Henri Bedimo (WL) -Matthew Adongcho (WR)- Eric Maxim Choupo-Moting (FW) –Samuel Eto’o (ST). Cameroon needs to score goals. They have been unable to score in a competitive fixture in almost a year. The last time they scored and/or won a game was in their 3-1 defeat of Mauritius in September last year. Cameroon media seem to think coach Javier Clemente has decided on a 4-4-2 to end this goal scoring drought. I suspect the team will pan out as a 4-2-3-1 on the pitch as was the case against Senegal in Yaounde. The 4-2-3-1 formation gives them reliability in defence (with 2 central midfielders + back 4) and flexibility in attack (with three attacking player behind the main striker). To make the formation even more attacking – the coaches could recommend a greater contribution from the full-backs in support of the high wide midfielders to offer more width. That was not the case against Senegal. Song and Djemba may be nominally defensive midfielders but they have shown in their clubs that they have the intelligience and technique to surge forward. They would be required to be more involved in attack. Playing as a 4-2-3-1 balances the team and the numbers in midfield allow the team to play for possession well, often with numbers up, especially against an opponent that is likely to play five men in midfield. 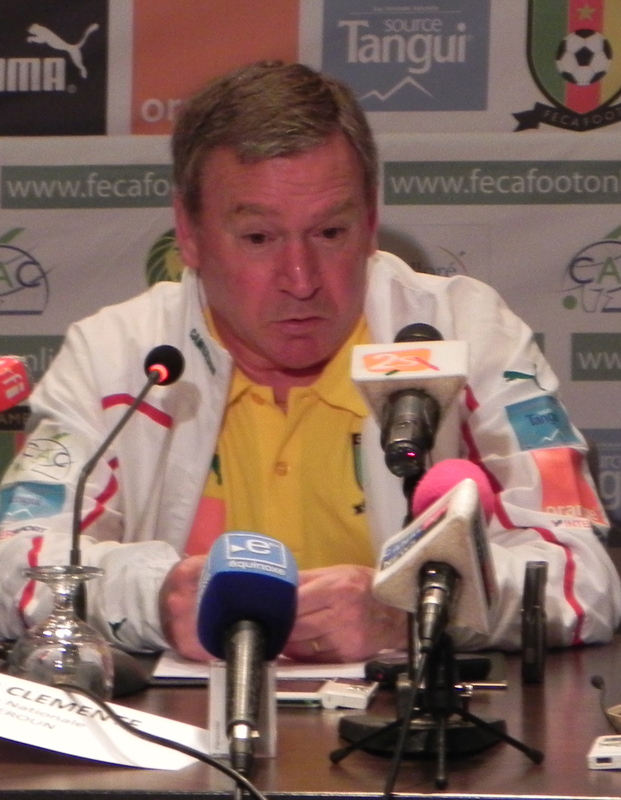 Mauritius are not travelling to Yaounde with a realistic hope of beating Cameroon. Mauritius would seek to keep things tight at the back and concede as few goals as possible. Last year, they played a very defensive 4-5-1 against Cameroon and would certainly reappear in that formation. Their plan being to sit deep, defend and if possible counter-attack. Cameroon on the other hand need to score. Score to regain confidence in themselves; score to prove that there is some relative improvement in their out-put; score to get the fans behind them again; score as many goals as possible to keep their slim hope of qualification going. A few things to note about Clemente’s choices. 1. Sebastien Bassong has fallen down the pecking order. In Stephane Mbia’s absence, the coach has opted for Chedjou as Nkoulou’s centre-back partner. Chedjou has been playing more regularly for his professional club than Bassong. Hopefully, the versatile Lille player (he can also play in midfield) would wipe out the souvenir of an unsettled player who scored an own-goal at the Africa Cup of Nations when he was fielded as a central defender for Cameroon. 2. In midfield, Clemente decided to drop Landry N’Guemo and Enoh Eyong, preferring Alexandre Song and Eric Djemba who have not played with the team for a very long while. Hopefully, their experience gets them to instantly click with their teammates. 3. In attack, Clemente called or recalled several attackers but he seems to have preferred the people he knows. He thus plays Bedimo (a leftback at his club) in a more attacking role. He also chose to play Adongcho ahead of the crowd of Europe based forwards in the camp. Adongcho is a natural wide player that the staff discovered during a special selection camp. He scored in a friendly against Macedonia. The coaches have since kept him in the squad despite media reports that he might not be playing regular football in America. Goodluck to Clemente and his team and see you after the game for a tactical analysis. I have not watched Cameroon train and the media have largely focused on side-events such as the tense relationship between Alex Song and Samuel Eto’o – which makes it hard to discuss coach Javier Clemente’s plans for Saturday. Nevertheless, the Spaniard promised a more offensive game. Does that mean he would change his personnel to accommodate more attack-minded players than in Dakar? A few reports have suggested that he is planning a 4-4-2 with Eto’o and Webo as the strikers, while the young, Monaco based forward, Benjamin Moukandjo (or Valenciene striker Vincent Aboubakar) would be fielded on the right flank. Unfortunately, the reports have not stated if Henri Bedimo (who plays left-back at Lens) would continue as left winger. If Clemente has effectively opted for 4-4-2 it would mean a greater use of the wings to stretch the game but it would also require the wide men to put-in inch-perfect crosses and have the ability to take their markers in one-on-one dribbles à la Valencia (Manchester United) to create space and allow the forwards to take suitable positions. With only Webo as a good header of the ball against a Senegalese defence of very tall and physical players, banging ill-timed high crosses would be a fruitless strategy. That formation would mean one-to-one battles in the midfield as opposed to the Dakar game while the Cameroon full-backs will be bereft of the protection from and extra midfielder. This would expose them to the trickery and pace of the Senegalese wingers (who are actually attackers). Moreover, this would not solve the key problem that Cameroon faced in Dakar which was lack of penetration from the centre. Nguemo was supposed to act like a box to box mid-fielder to support Webo but it didn’t quite work out. Eto’o often had to retreat into central midfield positions to link up play. It’s a shame that Clemente did not retain Somen Tchoyi. He could have done this very well. Nonetheless, I suspect Clemente would keep the shape of the team close to what we saw in Dakar and play in a sort of 4-1-2-3. Sadly, Assou-Ekotto who adds an extra attacking dimension from full-back is an injury doubt. A back four of: Benoit Amgwa (RB) – Nicolas Nkoulou (CB) – Sebastien Bassong (CB) – Gaetan Bong (LB). Stephane Mbia (CM) to sit in-front of the back-four; Aurelien Chedjou (CM) and Landry Nguemo (CM) working box-to-box. A forward trio of: Benjamin Moukandjo (right) Samuel Eto’o (centre) and Maxim Choupo-Moting (left). The front-men can always switch positions. Choupo-Moting and Moukandjo regularly play as wingers in their clubs (though they are strikers) and are technically good to cut-in from the flanks into the centre of attack (à la Messi, Cristiano Ronaldo, Di Maria). They are tactically aware enough to drop deep to form a midfield 5 once Cameroon loses possession. Nguemo, Mbia and Chedjou play more defensive roles in their clubs but in the past (especially at youth levels) they played in advanced positions for the national teams. They have the energy to do the box-to-box roles that is required of midfielders in such a formation to give thrust and penetration to attacks like Essien, Lampard used to do in Mourinho’s Chelsea. The system is built on speed and power and thus accommodates the type of players Cameroon currently possesses when played in the Chelsea way rather than the Barcelona format which lays emphasis on technique. But, I am not the coach. It’s down to Javier Clemente.